3…2…1 Mars is calling, and we must go! The Eagle has landed! After spending several months preparing for this mission, 8 crew members from the USA, Spain, Germany, UK and Kuwait arrived at the lab. The first day was focusing on exchanging information and get hands on learning how to run the MDRS. Everyone was talking about how to cook on Mars, maintaining the water, and living in the isolation of Mars. The night provided us with a gorgeous view of the stars. Thousands of stars above us like we have never seen before, it is breath taking! 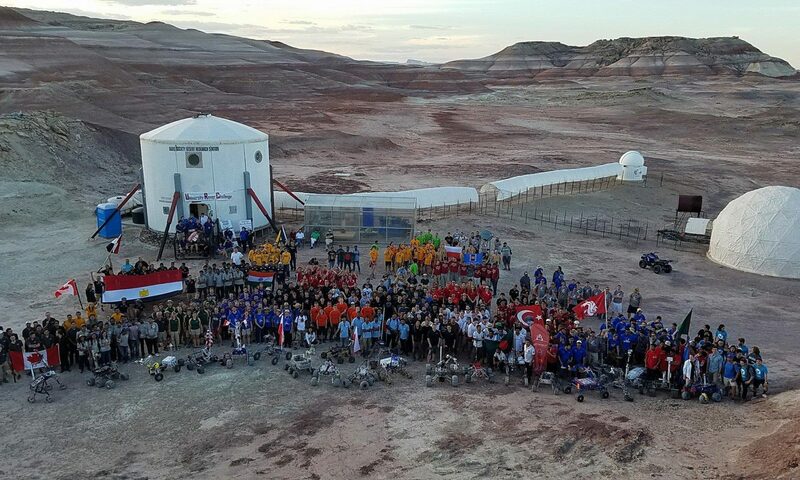 Today the crew woke up after a night inside the Hab, which hosted 12 Martians. Blueberry pancakes with maple syrup and coffee put energy inside every crew member. Early in the morning the two crews gathered outside to take pictures and watch the handover of command. Avishek, the commander from crew 204, shook Natalia´s hand with a smile to pass her the responsibility of commanding the International Emerging Space Leaders Crew 205. Two exciting weeks with a lot of experiments, EVAs and studies to understand leadership in such a diverse crew are ahead of us. But SAFETY first! So we held a briefing with Attila at 1100. At 1500 the first group of four gathered to get familiar with the rovers and the second crew followed in the afternoon. Tonight, Crew 205 will hold its first team meeting to go over our research goals, tomorrow´s EVAs, and the standard ISS voice protocol. Tomorrow we will enter the sim and we can’t wait!